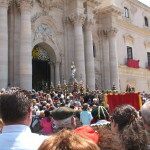 Saint Lucia (one of the most popular saints of the world) was born, and was martyred in Syracuse. 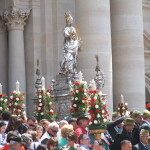 And ‘the patron saint of the city. 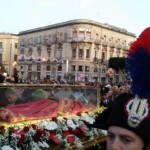 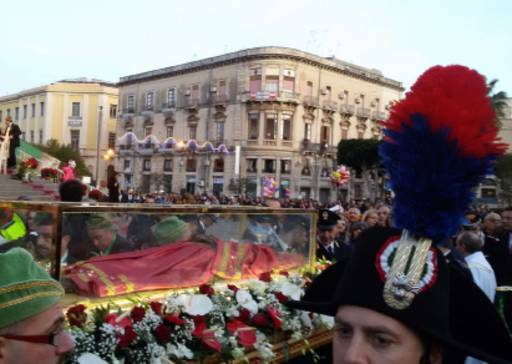 His body is located in Venice in the church of St. Jeremiah, near the Santa Lucia train station. 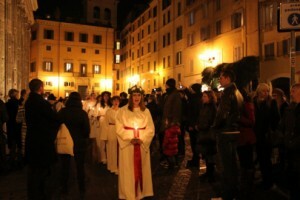 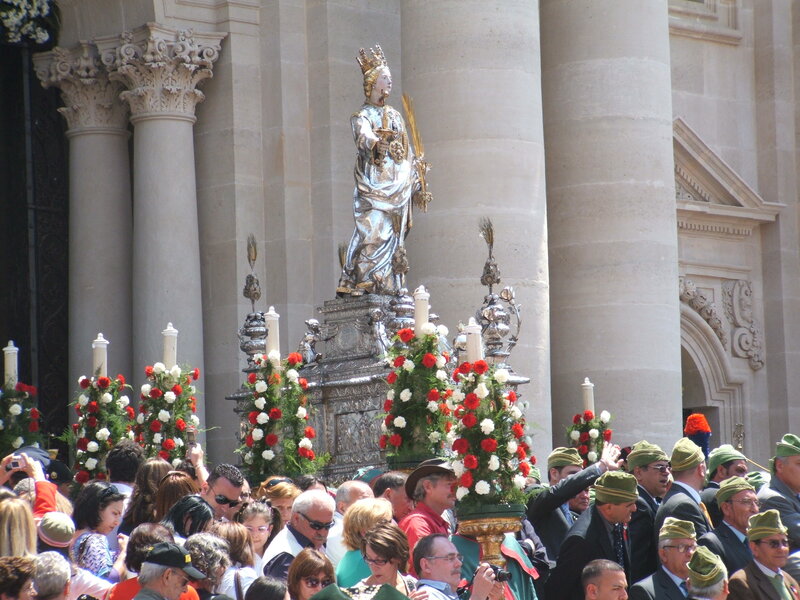 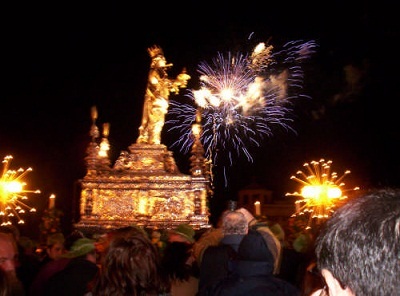 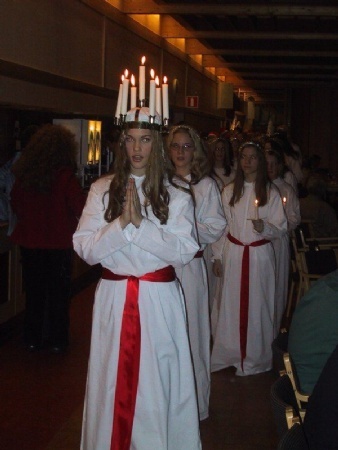 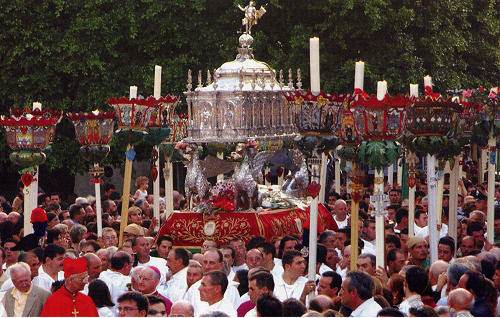 The main festival takes place on December 13 with a long procession (among the most crowded in the world) that translates the imposing statue of silver from the cathedral to the Basilica of St. Lucia. 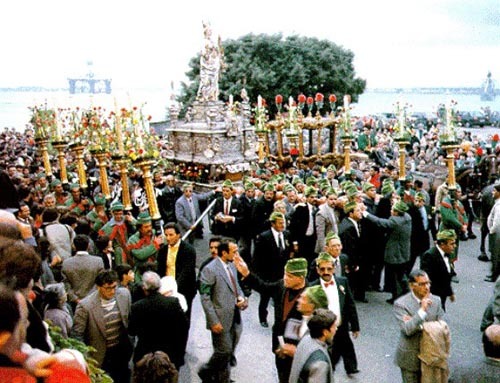 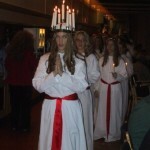 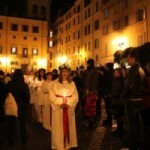 December 20 (the eighth day) is repeated the procession and the shift in the opposite direction. 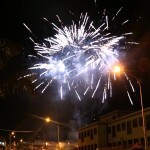 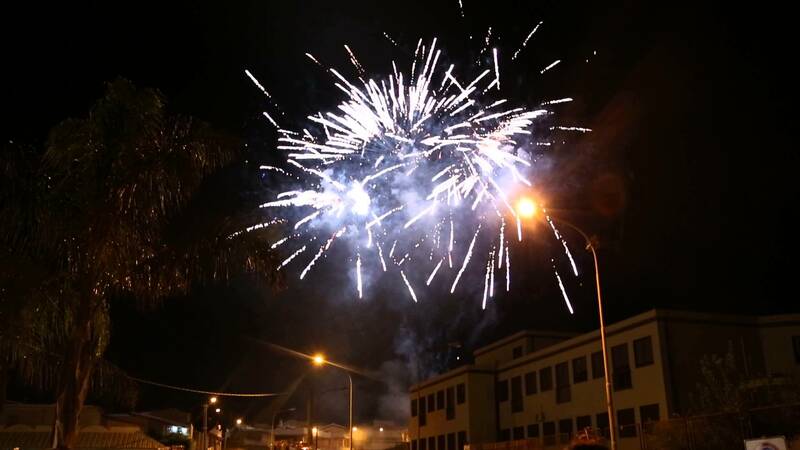 Characteristic the fireworks to step on the bridge Umbertino. 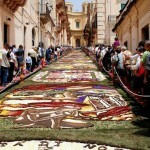 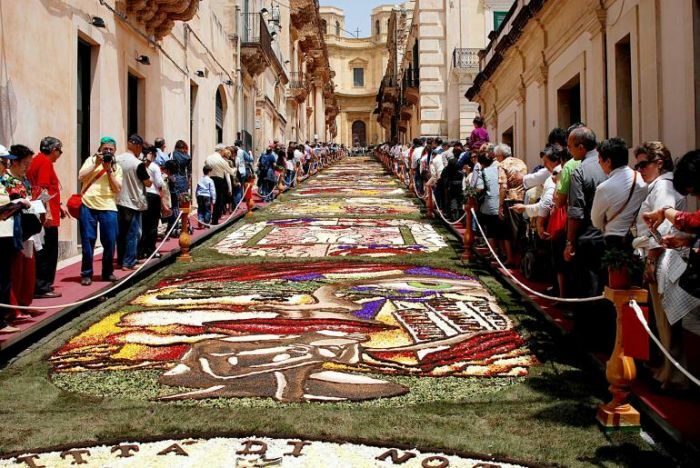 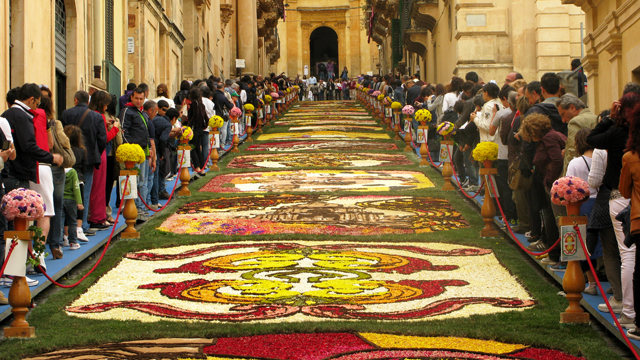 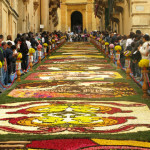 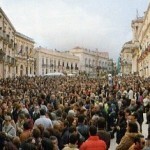 The Flower Festival of Noto: along Via Nicolaci local artists design and implement refined works of art using only fresh flowers; is an event of floral art that draws tourists from around the world. 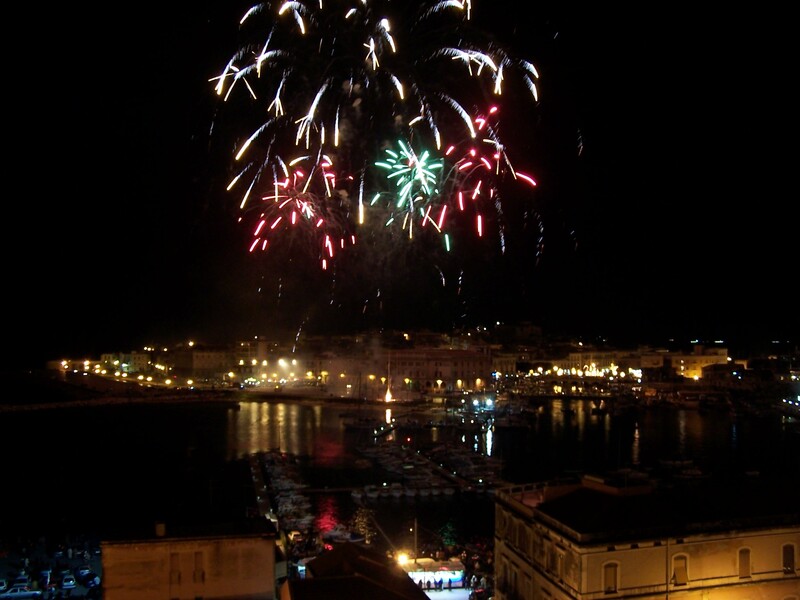 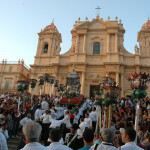 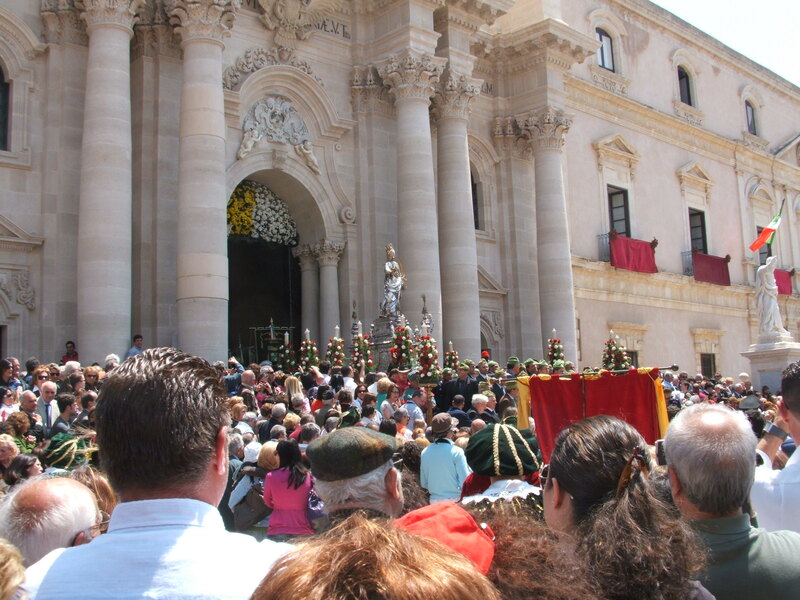 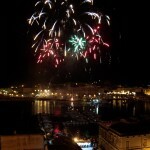 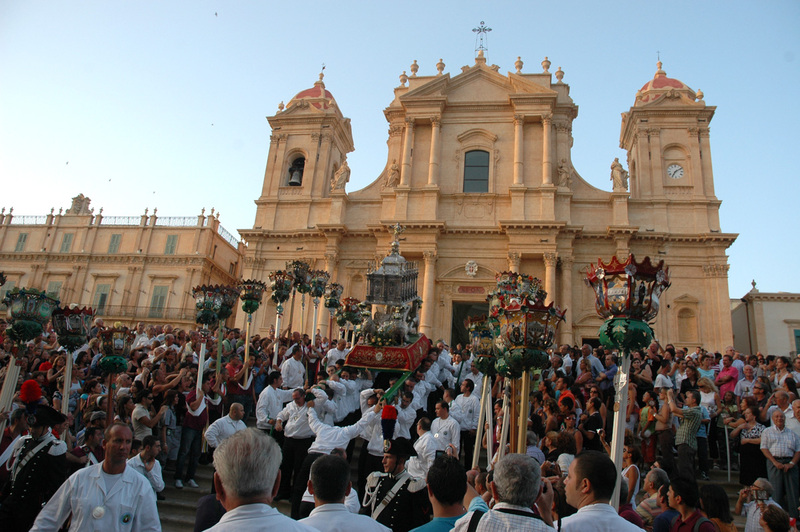 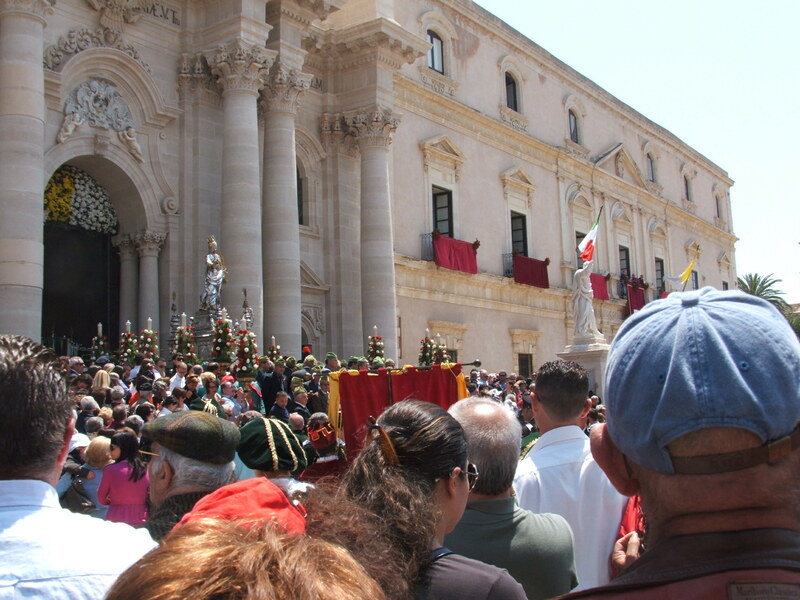 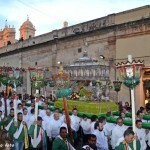 The Feast of St. Corrado Confalonieri, the patron saint of Noto is the main event of the summer of Noto and is celebrated in the second half of August. 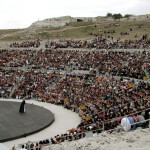 The program of the festival is packed with many events including concerts, theater and a jazz festival. 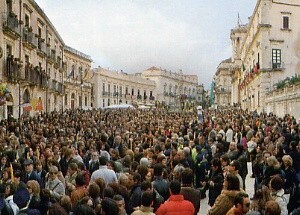 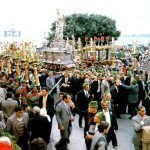 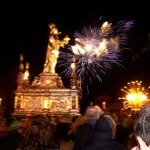 Carnival of Palazzolo is a historic event, with parades of floats, costumed groups and numerous festivals of local products. 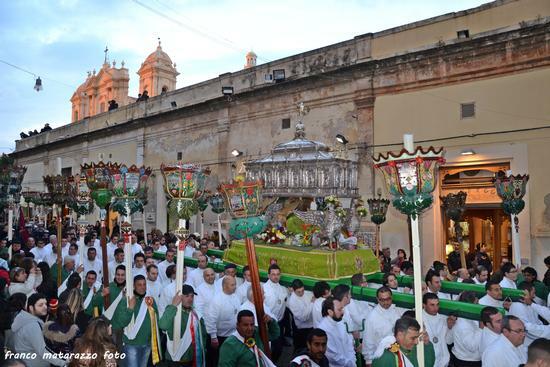 A good opportunity to spend a week of fun and taste the food specialties of the territory. 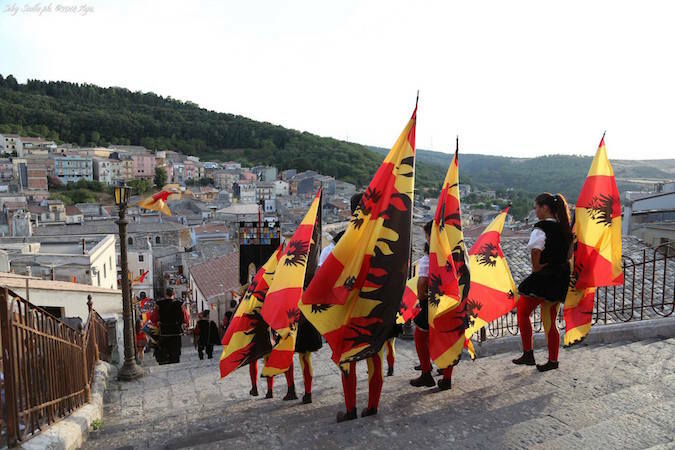 A review of the events that occurred in 1246 when the Buccheresi, with makeshift weapons, drove away the invaders Franks. 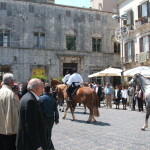 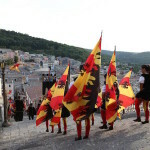 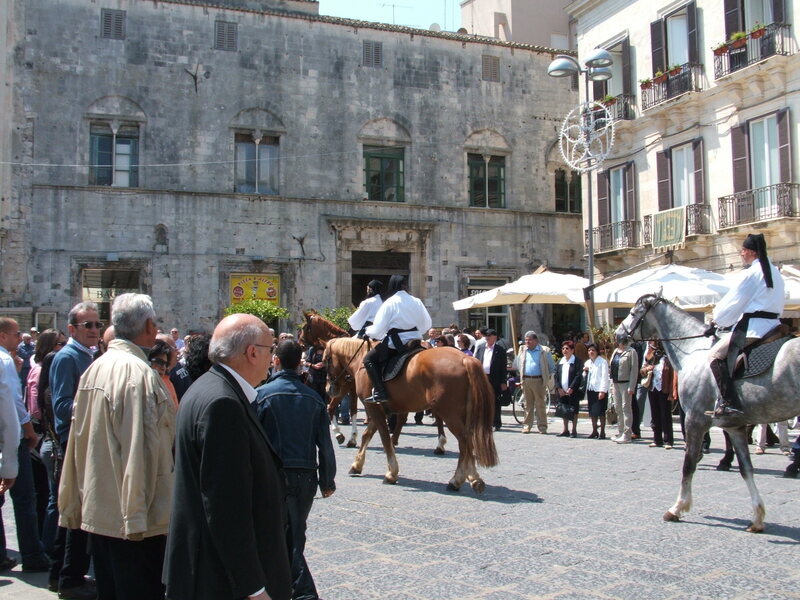 Numerous events enliven the evenings, with tastings of typical products, flag wavers, street performers, parades in ancient costumes, concerts, all in medieval theme. 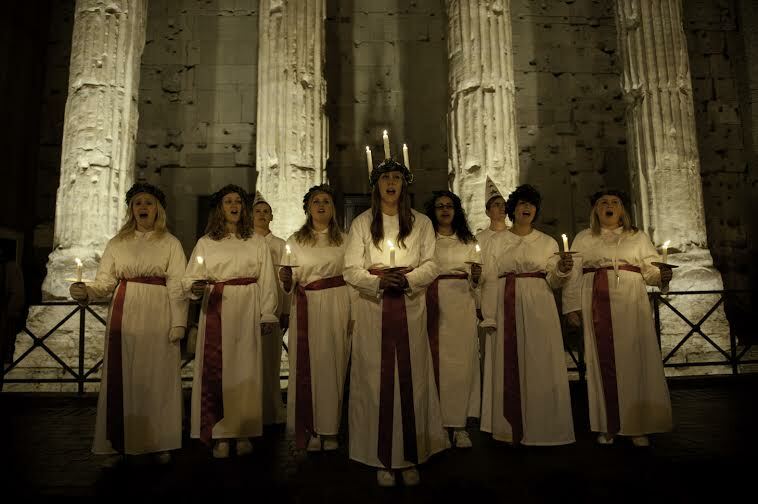 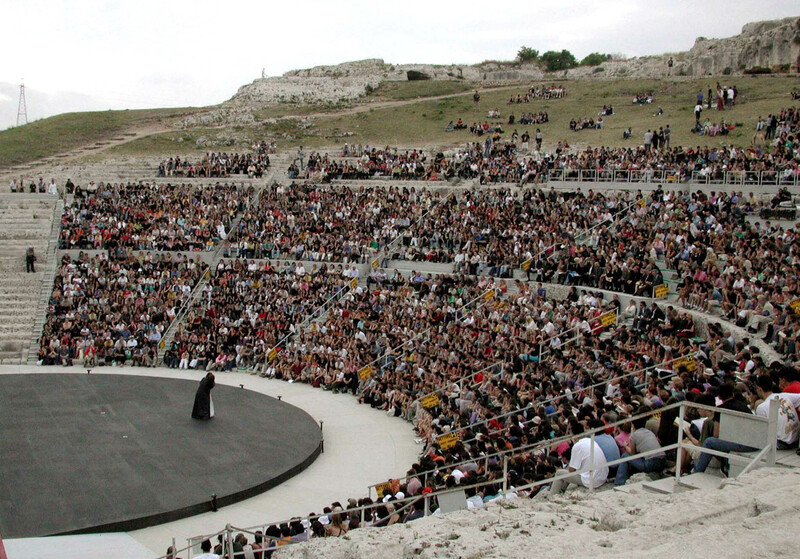 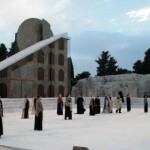 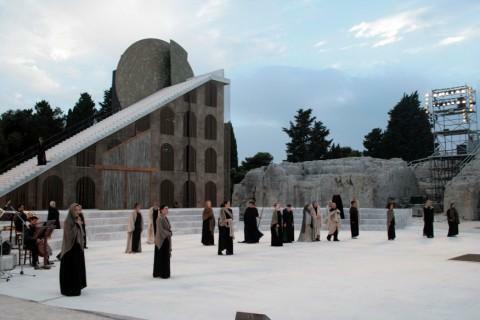 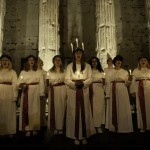 Every year during the months of May and June the Istituto Nazionale del Dramma Antico (National Institute of Ancient Drama) organizes the greek theater of Syracuse The season of classical performances that attracts a daily audience from all over the world. 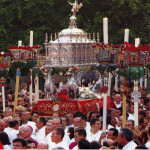 It is held every first Sunday of May. 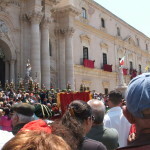 And ‘it preceded by a historical parade which commemorates the miracle of 1646 and ends with the characteristic launch of doves.